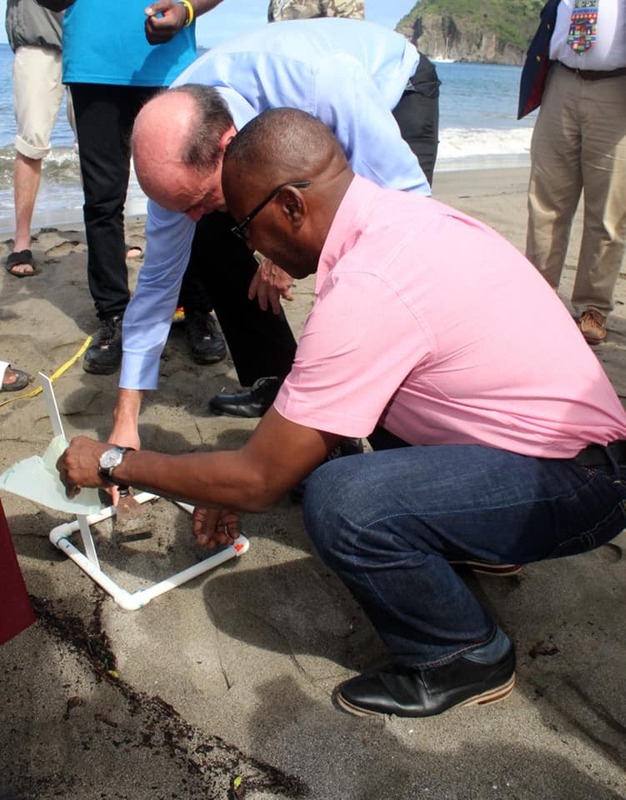 The Governor’s Office, the Ministry of Agriculture, Trade, Lands Housing and the Environment (MATLHE) / Fisheries Unit have joined several countries worldwide on a global research survey project by Exeter University on the presence of Micro plastics at sea turtle nesting sites. This is considered to be the world’s most extensive beach survey. On Friday November 17, the Chief Fisheries and Ocean Governance Officer Alwyn Ponteen was joined by students from both the Montserrat Secondary School and the Montserrat Community College in collecting samples from three beaches, namely Woodlands Beach, Carr’s Bay and Little Bay. These beaches selected for the pilot micro plastic project represents beaches at the mouth of the river that have the most anthropogenic pollution impact on the marine environment from human activities. The process involves collecting samples from the strand line (the highest line of debris left from the retreating tide) and the turtle nesting line (a point on the transect through the typical turtle nesting area). The samples will be sent back to Exeter University where they will analysed for the presence of micro plastics. The dataset will be produced as a co-publication with all contributing scientists as authors (1-2 authors per site) and will form a baseline for the sea turtle community and the oceanographers that are modelling plastic dispersal/dispersion around the globe. The data result of the sand analysis would also aid the understanding of current nesting sites and potentially inform what future conservation actions are needed on Montserrat to preserve these. The intention is that the dataset would be ready to share at ISTS 2020- putting this issue into clear focus and raising Montserrat’s profile as it shows our readiness to engage with international academic research and support conservation work. As an emerging field of study, not a lot is known about micro plastics and their impacts. This global project will have standardized field methods for collecting sediment, sand, and surface-water micro plastic samples. Eventually, field and laboratory protocols will allow for global comparisons of the amount of micro plastics released into the environment, which is the first step in determining the final distribution, impacts, and fate of this debris. Micro plastic contamination of the oceans is one of the world’s most pressing environmental concerns. The terrestrial component of the global micro plastic budget is not well understood because sources, stores and fluxes are poorly quantified. Given their pervasive and persistent nature, micro-plastics have become a global environmental concern and a potential risk to human populations. The time is now to build synergy and human capacity to examine the growing understanding of the nature, scope and impacts of micro-plastics.